Well the rumours were once again true, Guns N’ Roses are in fact returning to The Joint in Las Vegas this year for a second residency. The group last played there in 2012 when they headlined 12 shows as part of their Appetite For Democracy tour. This second event is titled ‘No Trickery! An Evening Of Destruction’. The shows will take place between late May and Early June this year with tickets going on sale this Friday, Feb 21st prices $49+. No confirmations about the set list have leaked yet but the band has discussed mixing things up a little more than the 2012 event. The last outing kept a similar set to their regular touring selections. Fans this time will be hoping for something a little different to make the shows more special. 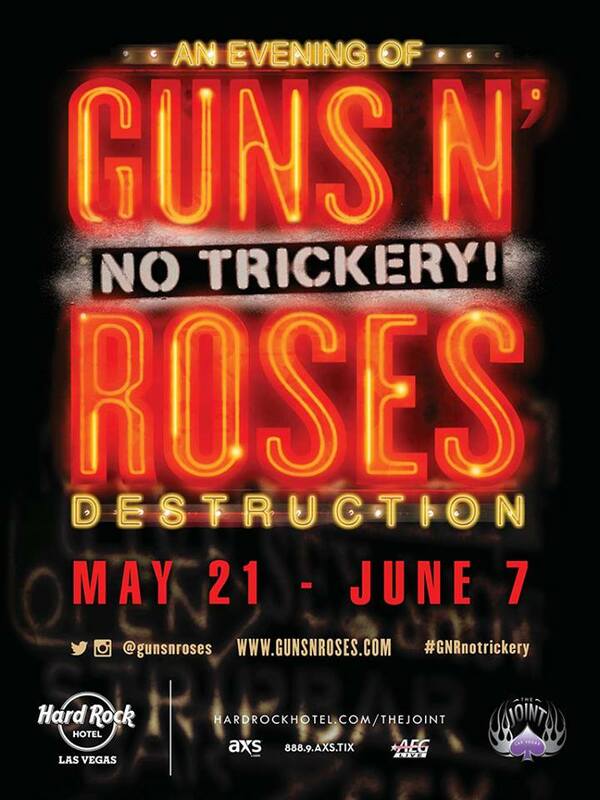 This entry was posted on February 18, 2014 at 4:29 pm and is filed under Gig Listing, Music, News with tags 2014, 2014 tour, Appetite for Democracy, Guns N Roses, Las Vegas, No Trickery! An Evening Of Destruction, Residency, setlist, tickets, tour dates. You can follow any responses to this entry through the RSS 2.0 feed. You can leave a response, or trackback from your own site.